Sculpted by Thomas Ball in 1872, “The Realization of Faith” serves as the monument for Jonas Chickering (1799-1853), noted piano manufacturer. Ball described the monument as “the Angel of Death, a winged youth, lifting the veil from the eyes of Faith, a kneeling female figure, who until now has seen ‘as through a glass darkly’ but now sees face to face.” The monument was sculpted in Italy and shipped to Boston in six boxes before being assembled on a granite foundation at the Cemetery. The Muse of music is featured in a bas relief at the base of the monument. 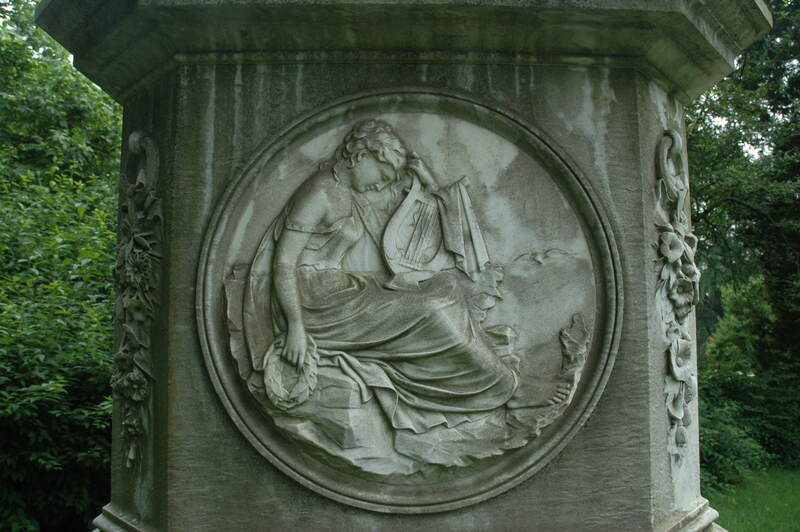 Her face is a display of anguish, and the sentiment is echoed by the broken lyre in her lap. Her other hand holds a wreath of laurel, a common symbol for fame and victory. These symbols would have been apparent to 19th-century visitors who knew Jonas Chickering as a Christian philanthropist, craftsman, and inventor who revolutionized the manufacture of pianos in America. Source: Ball, Thomas. My Fourscore Years: Autobiography. Trecavalli Press, 1993.